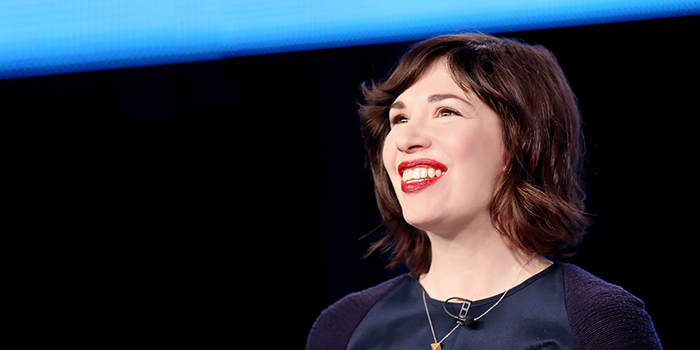 Carrie Brownstein has become accomplished in several creative avenues, including playing guitar and singing for Sleater-Kinney, and writing and acting in IFC’s sketch comedy series, “Portlandia,” which she co-created with Fred Armisen. It’s no surprise then that her conversation with Vendela Vida at San Francisco’s Nourse Theater centered on the topics of creativity and performance. The interview provided several insights into her work on “Portlandia” including the process of creating absurd, awkward moments, which has become one of the series’ specialties at this point. Brownstein credited the show’s editors with their proficiency in leaving odd sounds in a scene, and also talked about the benefits of casting non-actors – a simple way to create awkwardness on-screen. Before the interview began, several sketches from “Portlandia” were projected on the screen, which spoke to the fact that across the country, Brownstein may be best known for her role in the show. However, some of the most significant moments of her talk came when she spoke about her time with Sleater-Kinney. When the topic of conversation shifted from real life inspirations for sketches and celebrity cameos on the show to questions about her former band, a huge reaction came from the audience. From there, Brownstein talked about her exuberant and energetic performing style, commenting that playing guitar on stage offers an opportunity that’s rare in society: the space to become unhinged, and to be rewarded for it. When asked what it was like to be a pioneer in the riot grrrl movement, Brownstein replied that the band had very little awareness of its growing role and influence. Instead, the focus was on making music and doing something that made the group’s members feel alive. If you want to pretend for a minute that you know more than we do about music, go ahead, send us your thoughts.